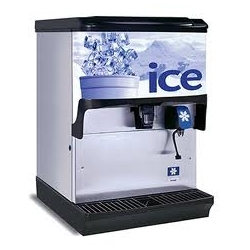 Servend Ice Dispenser with 150 Lb. Storage Hopper. Attractive Stainless Steel Finish. Perfect for Hotel/Motel Breakfast Areas as Well as Convenience Stores. Unit is 23" W X 32" Deep.